The Presque Isle hockey team was able to avenge one of its early-season losses on Tuesday, defeating the Kennebec Riverhawks, 4-1, in a match played at Colby College. WATERVILLE, Maine — The Presque Isle hockey team was able to avenge one of its early-season losses on Tuesday, defeating the Kennebec Riverhawks, 4-1, in a match played at Colby College. Gage LeTourneau broke a 1-1 tie with a second-period goal, which was assisted by Jake Stevens and Thomas Patenaude. 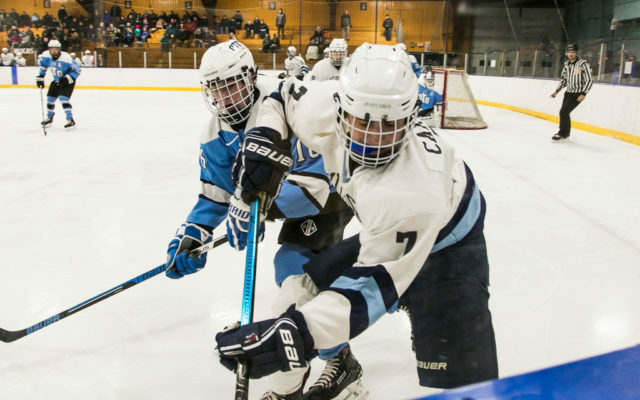 The Wildcats tacked on an empty-net goal with 1:30 left in the match, courtesy of Connor DeMerchant, and then scored again 24 seconds later as Jonah Roy scored off assists by Stevens and Patenaude. Presque Isle opened the scoring in the first period as Colby Carlisle scored off assists by LeTourneau and Torey Levesque. Kennebec scored their only goal late in the period. The Wildcats owned a 36-19 advantage in shots on goal. Andre Daigle picked up the win in goal. The Riverhawks defeated PI at the Forum Dec. 28 by a score of 8-5. “Hopefully this will start our momentum going down the homestretch and into the playoffs,” said Wildcat coach Carl Flynn, whose team is now 10-3 and in the No. 4 position in the Class B North standings. The squad has five regular season matches remaining — the next two coming on Friday at 7 p.m. against Hampden Academy and Saturday at 1:15 p.m. against John Bapst. Both will be played at the Forum.